Fellowship Previews: America's Favorite Felines Come Face to Face When GRUMPY CAT Meets GARFIELD! America's Favorite Felines Come Face to Face When GRUMPY CAT Meets GARFIELD! Dynamite has published the comic book, The Misadventures of Grumpy Cat, featuring "The World's Grumpiest Cat" and her brother Pokey since 2015, selling over one half million copies and winning the hearts of readers of all ages! With her ever-present pout and sassy disposition, Grumpy Cat has become one of the world's most famous felines. Now, her unbearable cuteness and infectious sourpuss comes face to face with the original cartoon cat, Garfield! An exclusive partnership between Dynamite Entertainment and BOOM! Studios' award-winning imprint, KaBOOM!, will bring Jim Davis' iconic comic strip cat Garfield together with internet sensation Grumpy Cat in a limited series, with a story written by Jim Davis himself! 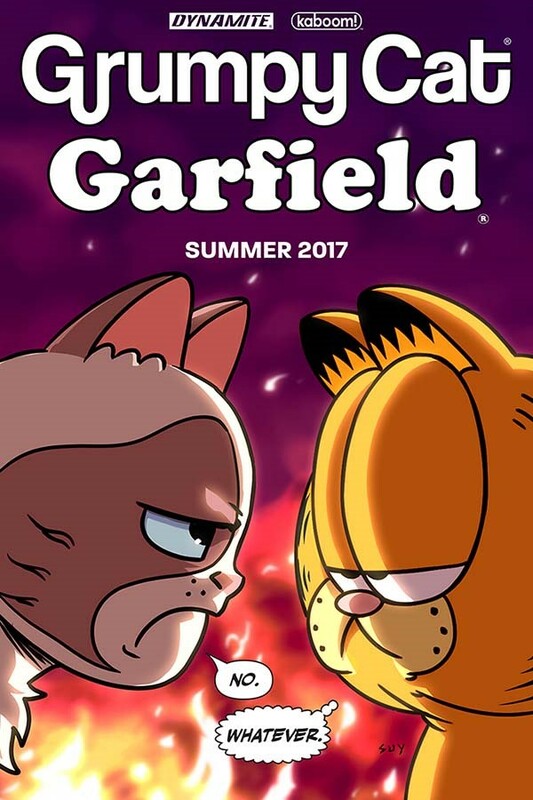 "Teaming up with Garfield for a comic series is a real honor," says Grumpy Cat. "I hate it." Nick Barrucci, CEO and Publisher of Dynamite says, "Working with the fine folks at Grumpy Cat has been absolutely wonderful; we've had tremendous success bringing Grumpy to our fans, and helped to grow the comics market with record breaking sales through the direct market, book stores, and Scholastic. Our Free Comic Book Day giveaways drew thousands of new fans to comic stores for the first time. Meeting Mr. Davis has been a highlight of my career and working with him and our friends Ross, Filip, and everyone at Boom! Studios to bring her into the world of Jim Davis' beloved comic strip is a once-in-a-lifetime opportunity. These are the two most famous felines in the world. I can't wait to see what trouble these two get into!" "Jim Davis approached us years ago asking us to publish the Garfield comic books and it's been a tremendous honor to work with one of the greatest cartoonists of all time and the entire team at PAWS," said Ross Richie, Founder and CEO of BOOM! Studios. "When I met with him at San Diego Comic-Con International this year to discuss this crossover, he was brimming with delight at the idea of these two felines getting together. His enthusiasm and affection for this crossover is infectious! This is going to be terrific fun! Look for more news about the comic book crossover event of the year in the coming months, with a release targeted for summer 2017!